Here are some ready made asso straps CG61701~ACG18 & gray straps, Bell & Ross BR-02 strap and some Panerai customer straps. 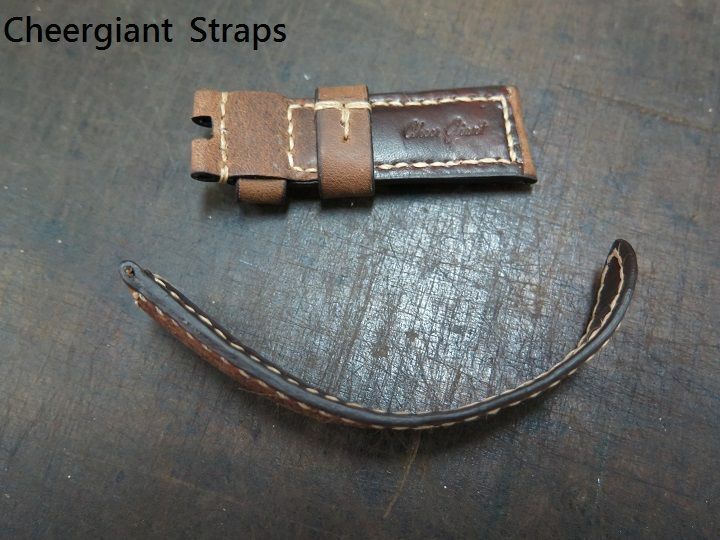 Each my posting strap could be made a new custom strap according to the specification of the custom strap order. 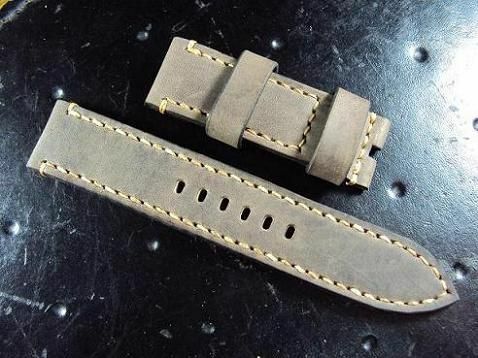 CG61701, Panerai Assolutamente leather strap, 24x22mm, 75x120mm, thick 6.5mm taper to 1.9mm, cream stitch. It fits the Panerai 22mm deployant clasp. 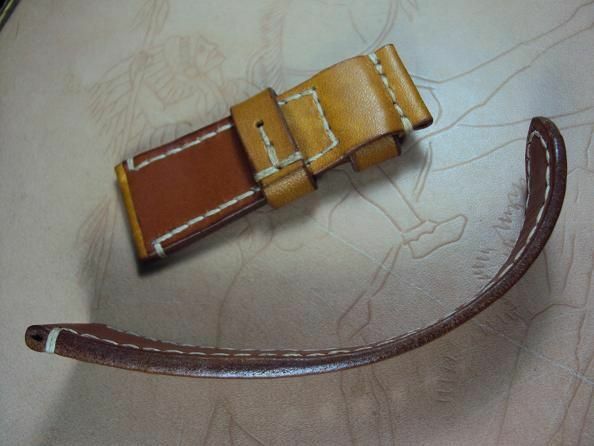 The Assolutamente leather strap is a padded leather strap which is a particularly difficult hand made leather straps. 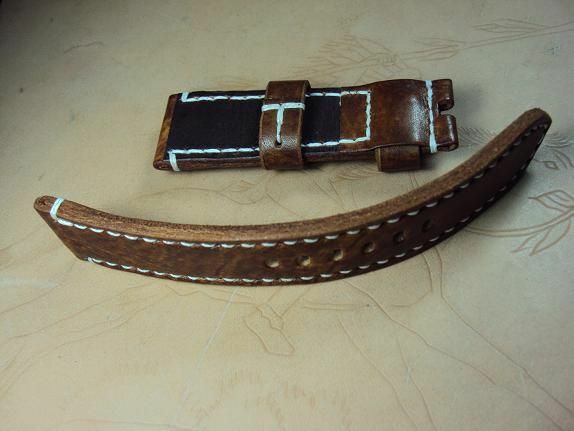 The thick at tail could be made in 3.5mm~ 4.5mm to fit the pre-v buckle. 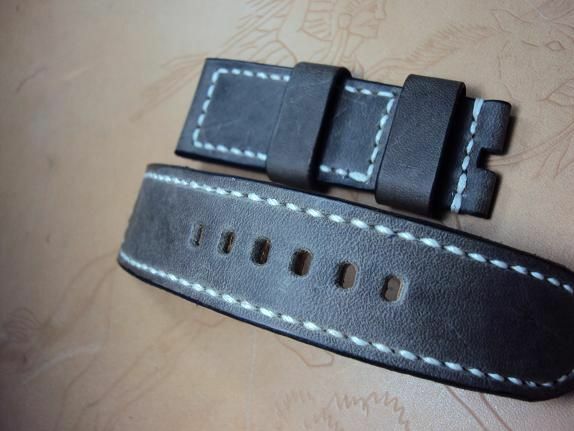 The Assolutamente leather strap is priced at $ 150 USD, now charges the promotional price at $ 100 USD including registered airmail worldwide shipping. 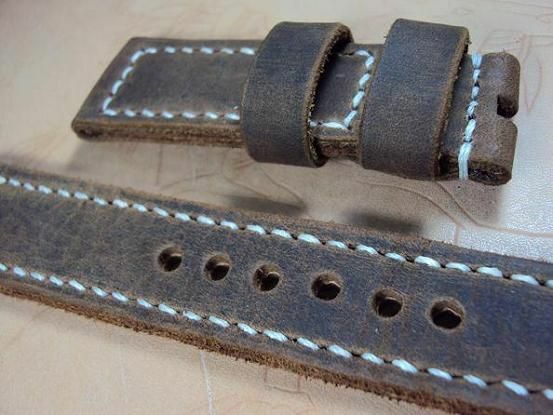 CG61702, Panerai Assolutamente leather strap, 26.5x22, 75x120mm, thick 6.5mm taper to 2.0mm, white stitch. It fits the Panerai 22mm deployant clasp. 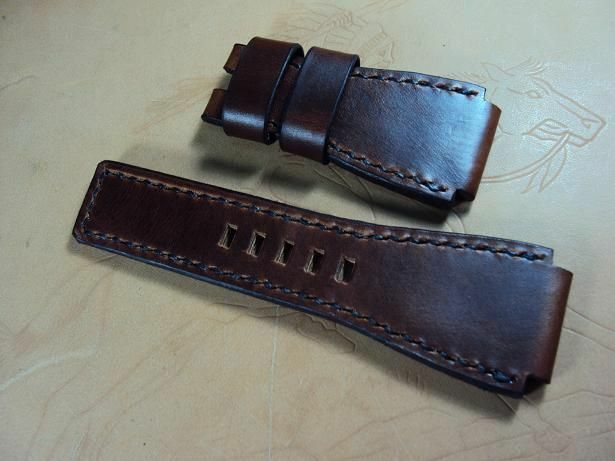 CG61703, Panerai Assolutamente leather strap, 24x22mm, 75x120mm, thick 6.5mm taper to 1.9mm, dark brown stitch. It fits the Panerai 22mm deployant clasp. ACG04, Panerai Gray vintage leather strap, 26x24mm, 75x135mm, thick 5.0mm taper to 4.0mm, white stitching. The Gray vintage leather strap is priced at $ 130 USD, now charges the promotional price at $ 80 USD including registered airmail worldwide shipping, or plus $15 USD for EMS shipping. 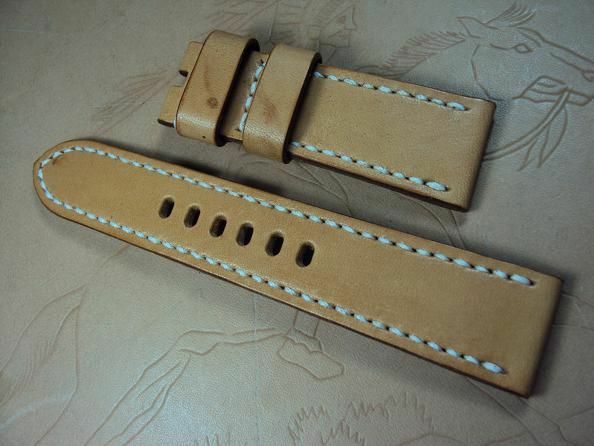 ACG05, Panerai Crazy horse strap, 25x24mm, 80x140mm, thick 5.0mm, cream stitching, raw edges. 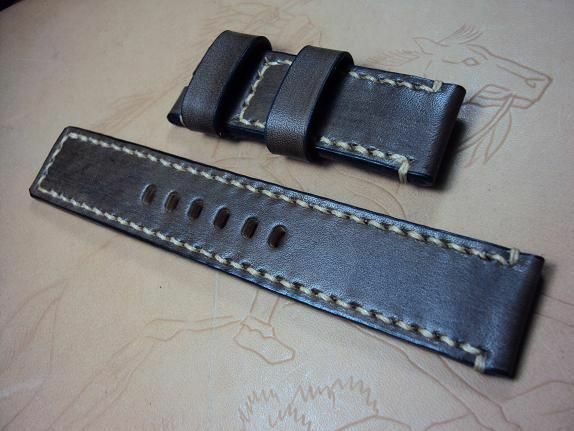 ACG06, Panerai Crazy horse strap, 25x22mm, 80x140mm, thick 5.0mm, white stitching, raw edges. 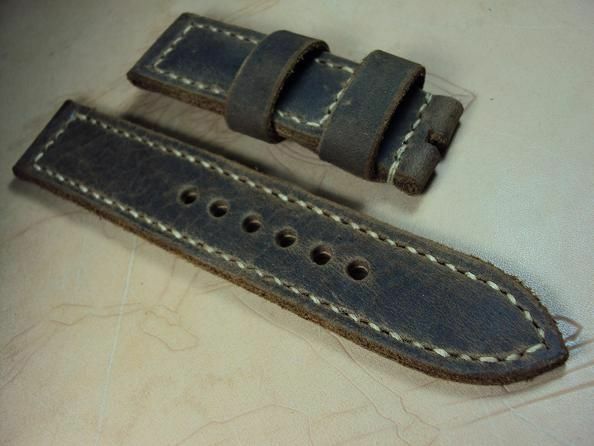 ACG07, Panerai grayish vintage leather watch strap, 24x24mm, 75x140mm, thick 4.5mm, cream stitch. 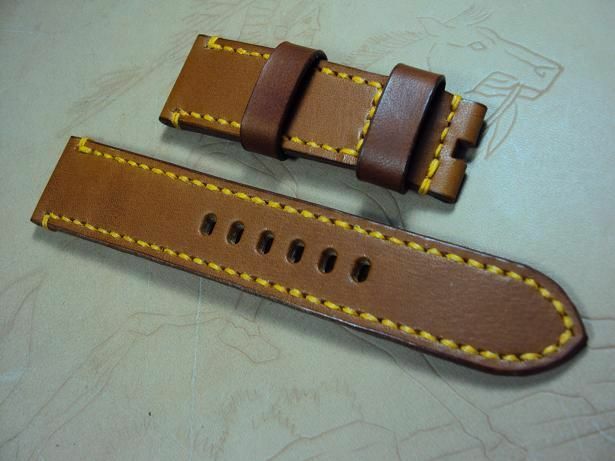 ACG08, Panerai orangeish brown leather strap, 24x22mm, 75x130mm, thick 5.0mm taper to 3.5mm, yellow stitching. 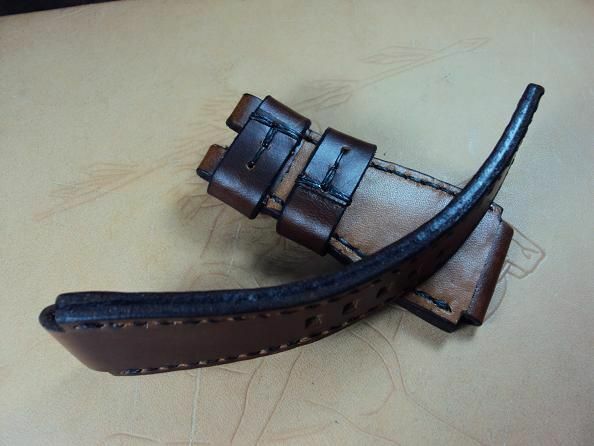 The thick 5.0mm would bear the heavy watch, and the thick 3.5mm at the tail would be flexible and comfortable. 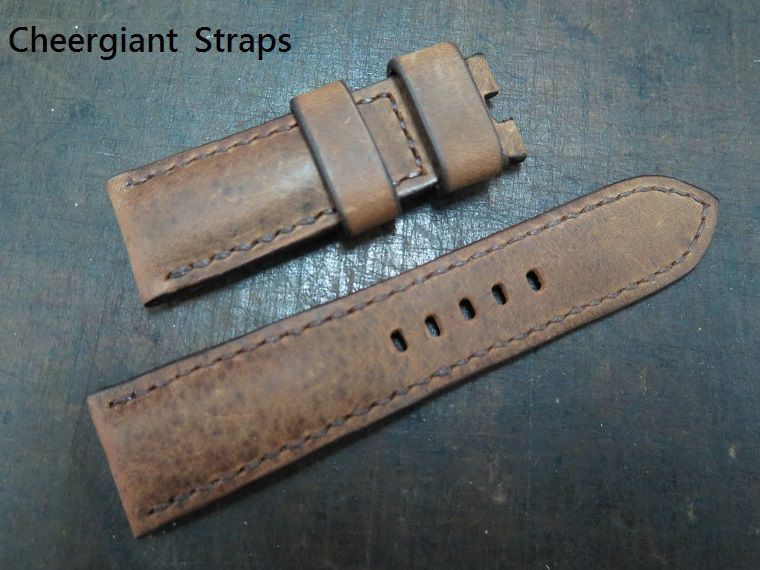 The orangeish brown leather strap is priced at $ 120 USD, now charges the promotional price at $ 70 USD including registered airmail worldwide shipping. 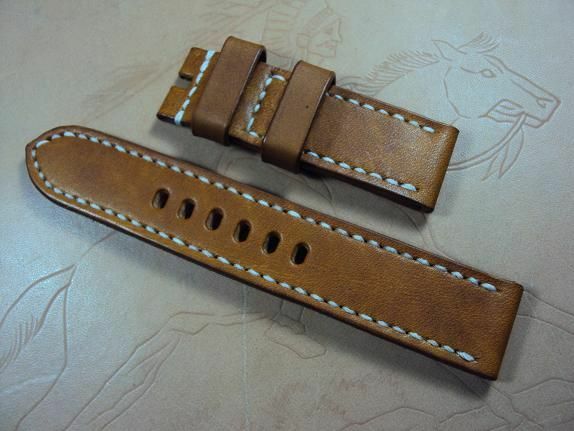 ACG09, Panerai ultrasoft tan leather watch strap, 24x22mm, 75x130mm, thick 4.5mm taper to 3.5mm, white stitching. 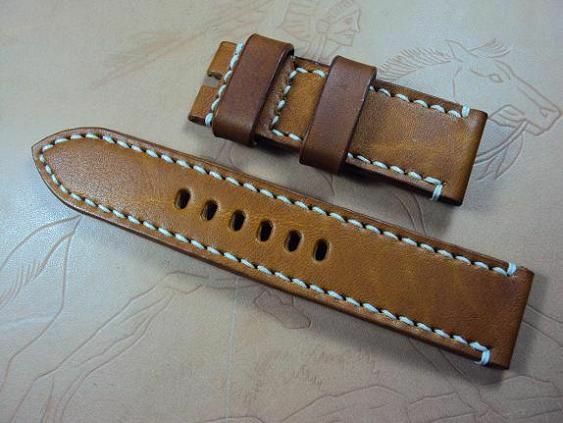 The ultrasoft tan leather strap is priced at $ 120 USD, now charges the promotional price at $ 70 USD including registered airmail worldwide shipping. 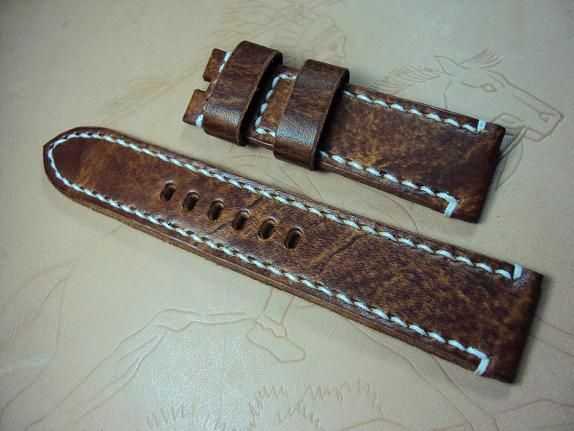 ACG10, Panerai honey brown grained leather strap, 24x24mm, 75x135mm, thick 4.5mm, white stitch. 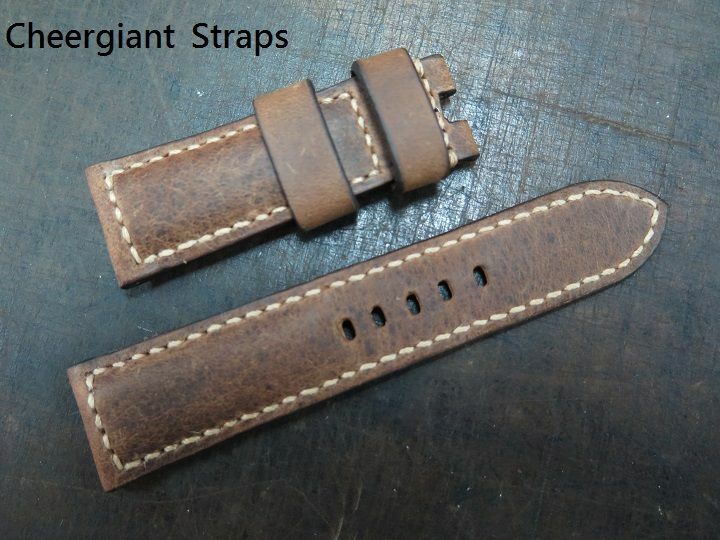 The honey brown grained leather strap is priced at $ 120 USD, now charges the promotional price at $ 70 USD including registered airmail worldwide shipping. 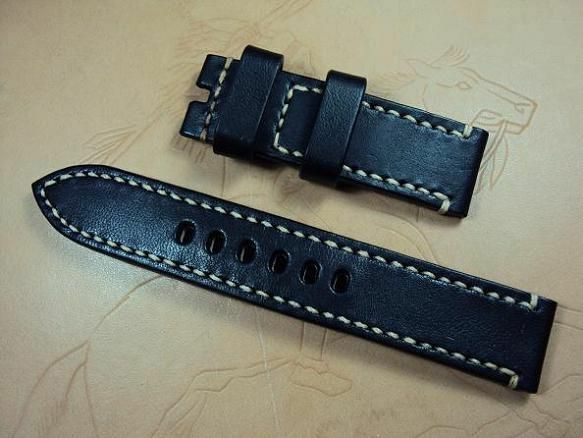 ACG11, Panerai black vintage leather strap, 22x22mm, 75x135mm, thick 5.0mm, cream stitch. The black vintage leather strap is priced at $ 120 USD, now charges the promotional price at $ 70 USD including registered airmail worldwide shipping. 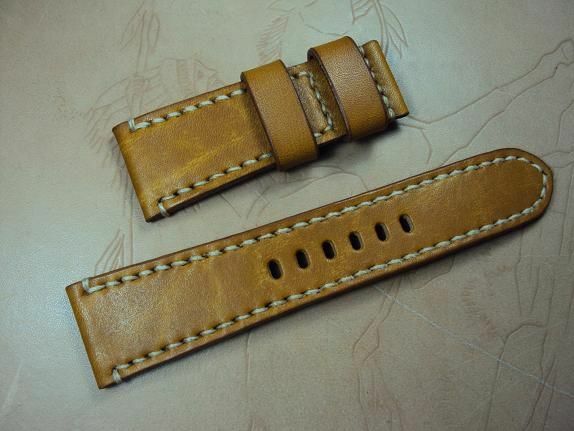 ACG12, Panerai honey brown leather strap, 22x22mm, 75x130mm, thick 6.0mm taper to 5.0mm, white stitch. The thick 6.0mm would bear the heavy watch, and the thick 5.0mm at the tail would be flexible and comfortable. 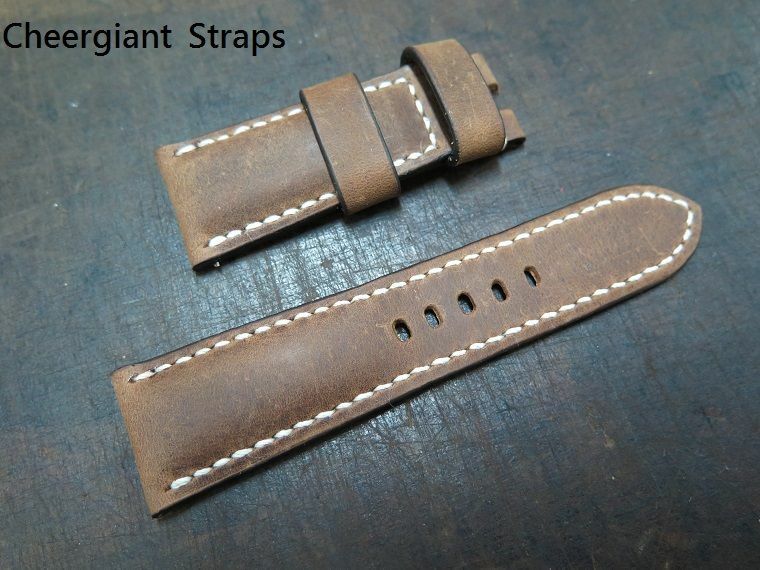 The honey brown leather strap is priced at $ 120 USD, now charges the promotional price at $ 70 USD including registered airmail worldwide shipping. 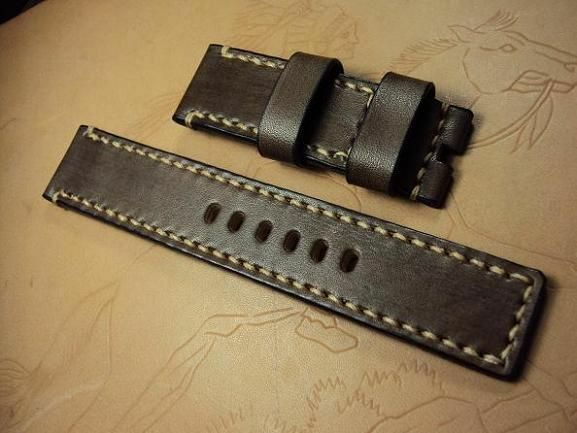 ACG13, Panerai deployant clasp coco brown grained leather strap, 26x22mm, 75x130mm, thick 4.5mm taper to 2.2mm, cream stitch. 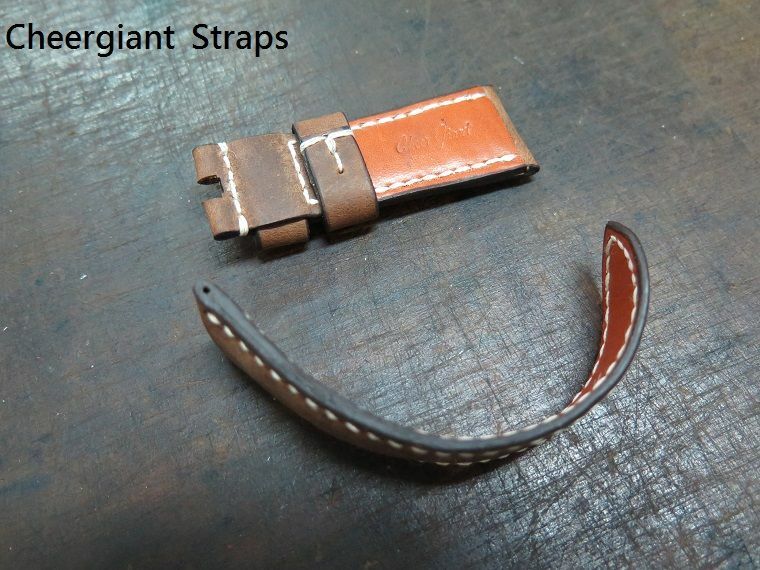 The thick 4.5mm would bear the heavy watch, and the thick 2.2mm at the tail would be flexible and comfortable. 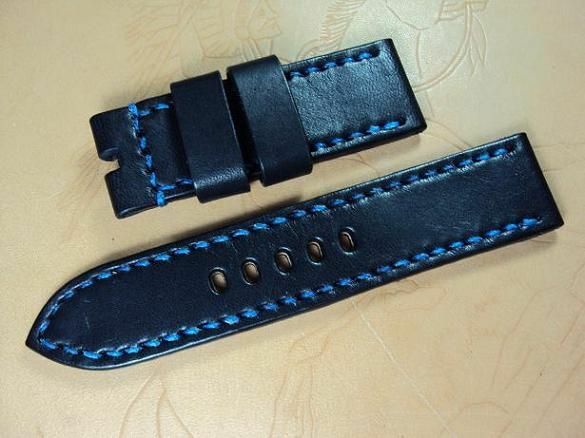 ACG14, Panerai ultrasoft black leather strap, 24x24mm, 75x125mm, thick 5.0mm taper to 4.0mm, blue stitch. 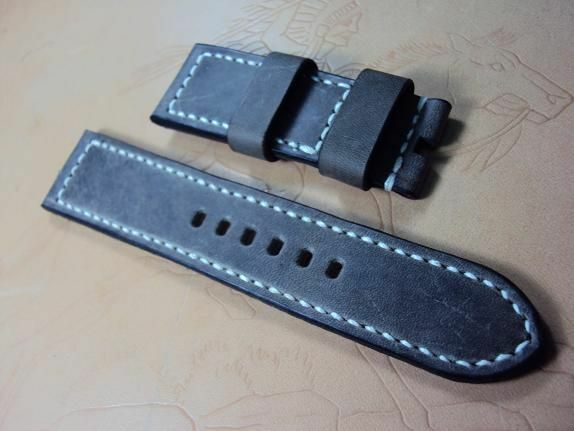 The ultrasoft black leather strap is priced at $ 120 USD, now charges the promotional price at $ 70 USD including registered airmail worldwide shipping. 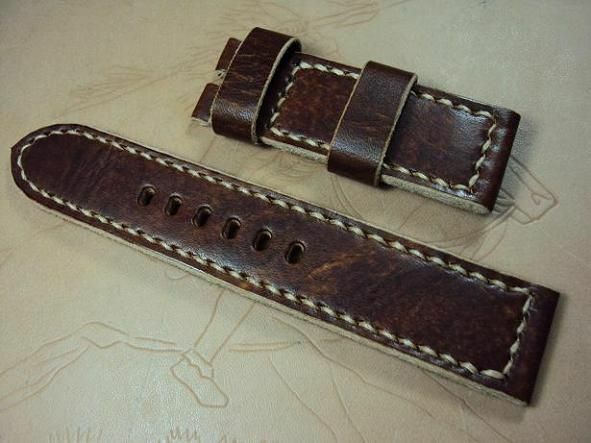 ACG15, Panerai chocolate brown vintage leather strap, 25x22mm, 80x135mm, thick 5.0mm taper to 4.0mm, white stitch. 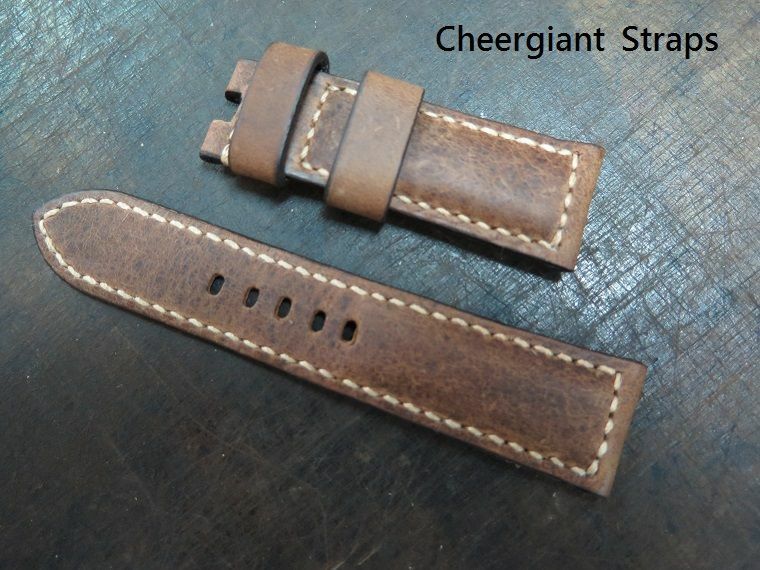 The chocolate brown vintage leather strap is priced at $ 120 USD, now charges the promotional price at $ 70 USD including registered airmail worldwide shipping. 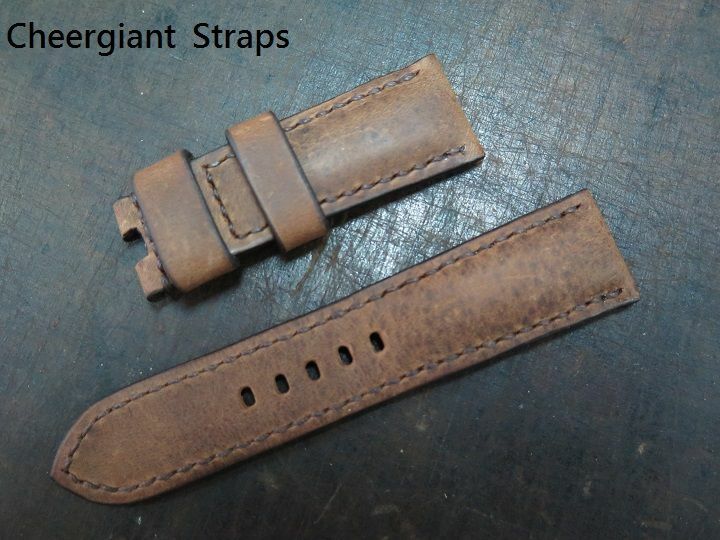 ACG16, Panerai grayish brown leather strap, 24x24mm, 75x133mm, thick 4.5mm taper to 3.5mm, cream stitch. 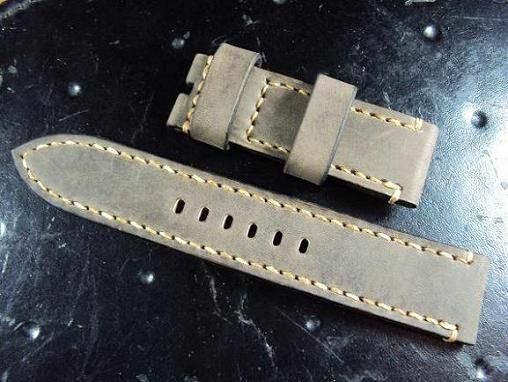 The grayish brown vintage leather strap is priced at $ 120 USD, now charges the promotional price at $ 70 USD including registered airmail worldwide shipping. ACG17, Panerai chocolate brown vintage leather strap, 24.5x24mm, 75x135mm, thick 5.0mm taper to 4.0mm, cream stitch, raw edges. 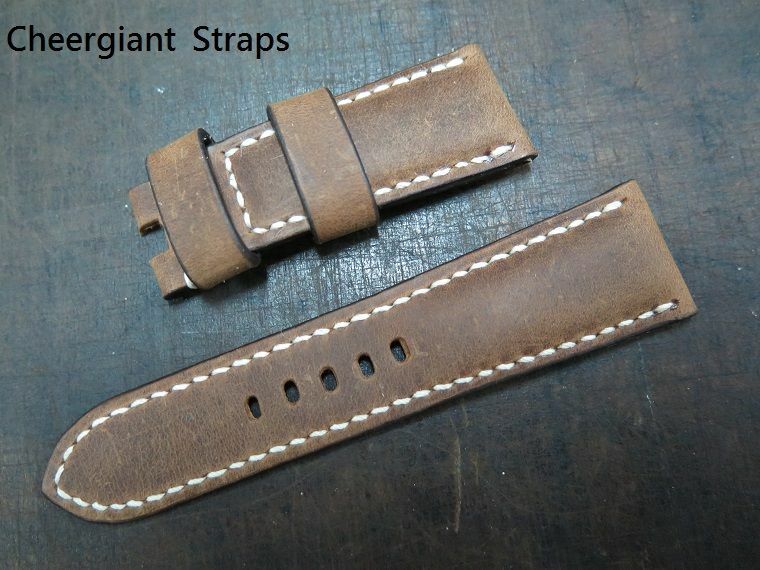 ACG18, Bell & Ross BR-02 brown vintage leather strap, 26x24mm, 75x125mm, thick 5.5mm taper to 4.0mm, black stitch. 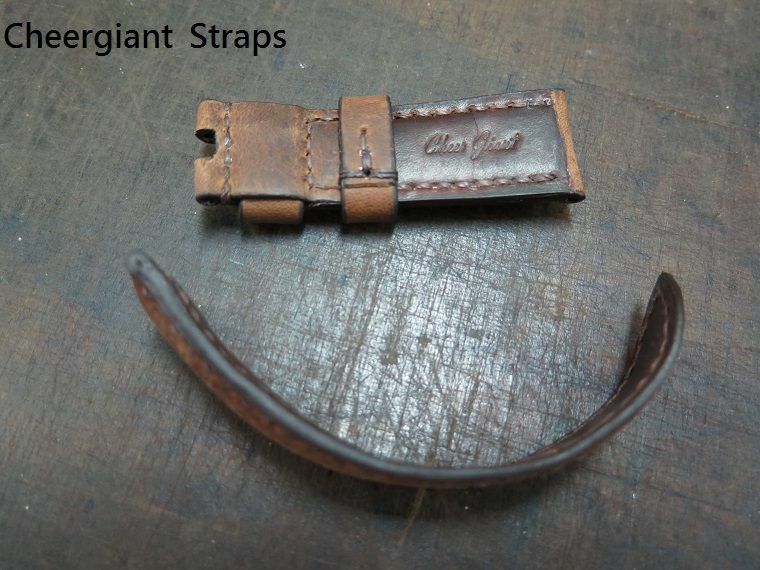 The thick 5.5mm would bear the heavy watch, and the thick 4.0mm at the tail would be flexible and comfortable. The BR-02 brown vintage leather strap is priced at $ 150 USD, now charges the promotional price at $ 100 USD including registered airmail worldwide shipping.